Khanom is a small town on the coast of Thailand, in the Nakhon Si Thammarat province. It’s quiet and peaceful and at first, it might seem that there aren’t many things to see and do there, but if you do some research, you will find that this area offers plenty of activities and sites to discover. 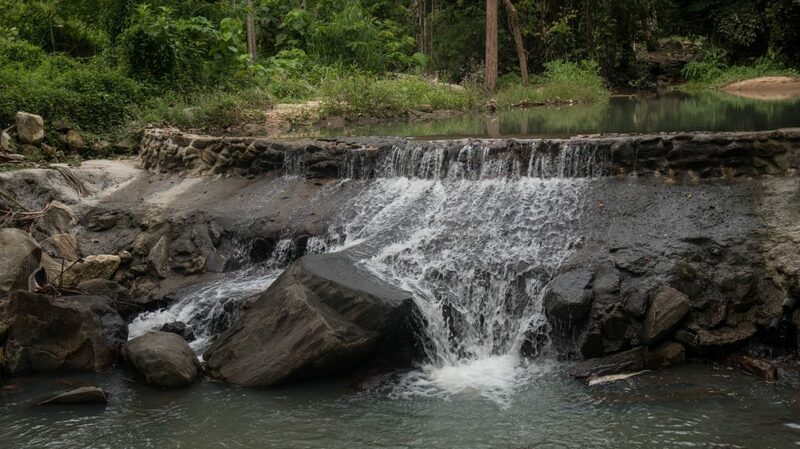 There are beautiful waterfalls, viewpoints with sweeping views over the ocean and nearby hills, caves, rubber tree groves and beaches that stretch for miles. Khanom has something for everyone. I had never heard about the town before. 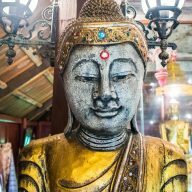 Only when I was planning my stay in Thailand during the rainy season had I discovered some information about it. It was supposed to be relatively dry in June and offered peace and quiet that I needed. Some articles claimed that it was one of the last remaining spots in the south that hasn’t yet been destroyed by mass tourism. I was sold and couldn’t wait to finally get to Khanom. I spent 5 days exploring the area. Every day I had something to do and I wasn’t bored at all even though I was there alone. I would get up at 9, take my scooter and drive for hours. I saw some beautiful and unique sites and I also had some adventures, which made my stay there even more special. Ao Nang Beach – the most beautiful one in the area. 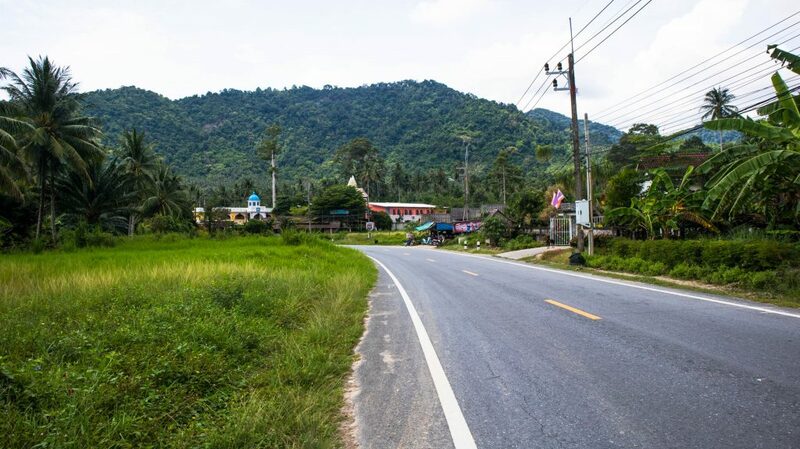 The town is located in the north of the Nakhon Si Thammarat province, very close to Surat Thani. It is a medium-sized municipality with a population over 10,000. Most of them live off fishing. Khanom is also known among Thai people for producing good quality shrimp paste, which is added to various Thai dishes. The beaches around the town are still quite deserted and not frequented by tourists. 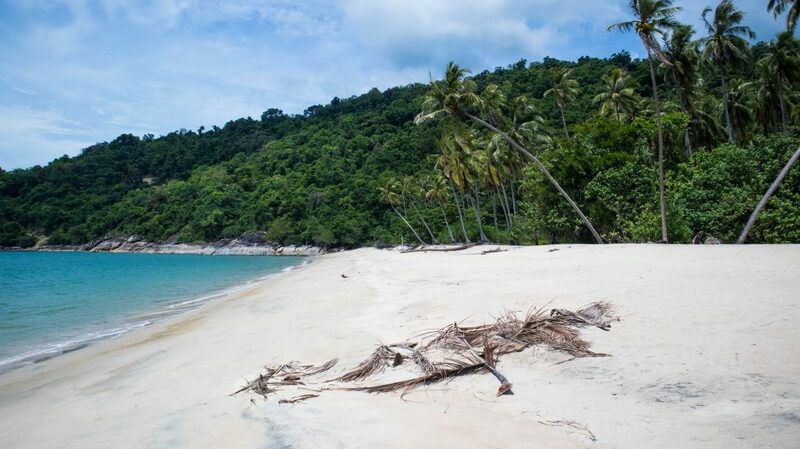 A lot of the coastline will be protected by Hat Khanom – Mu Ko Thale Tai National Park, which is being created at the moment. I took a flight from Bangkok to Nakhon Si Thammarat with AirAsia that lasted about an hour. 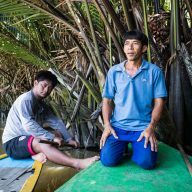 While sitting on the plane I realized that I had no idea how I could get to Khanom from the airport, but knowing I was in Thailand I decided to ask around after landing. 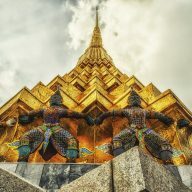 I find it very easy traveling in Thailand and I know that there will be either someone who would be willing to help me out, or there will be at least minivans waiting outside the airport. I wasn’t disappointed. Straight after I picked up my luggage and crossed the exit I saw a bit sign advertising tickets to Khanom. I bought one for 250 Baht. After 5 minutes I was sitting in a van heading to the town. The journey took about 2.5 hours. I was then dropped off at the center of Khanom and told that there would be some taxis. I stood on the street for a bit looking around. It didn’t seem like there was someone coming. There were a couple of shops, but no tourist offices, no adverts in English. A few people passed me on scooters rushing somewhere. For a few seconds, I thought I would get stuck and I would never get to my bungalow. 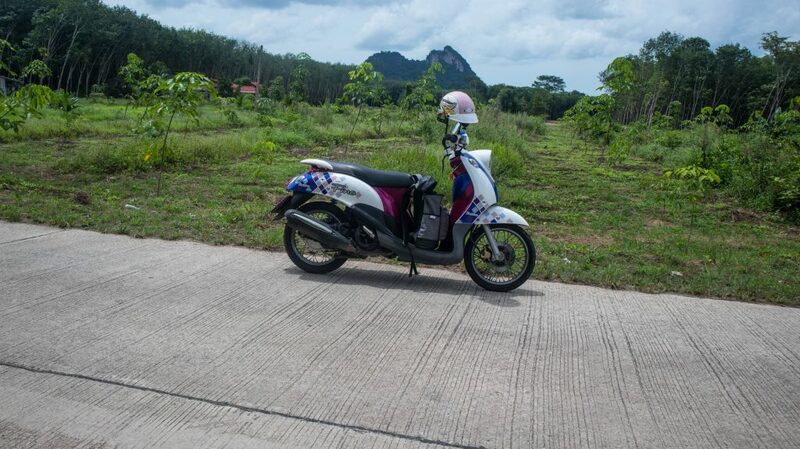 I was finally approached by a motorbike taxi driver, who took me, my small bag and my 10 kg suitcase on his small scooter and off we went. This 5-minute trip cost me 50 Baht. The roads here are empty and really picturesque. What to see and do in Khanom? Despite the fact that Khanom is a very small town, you will find plenty of things to see and do there. Below I listed my recommended activities. The beaches here might not be as beautiful as on the islands, but you can really chill out in Khanom. 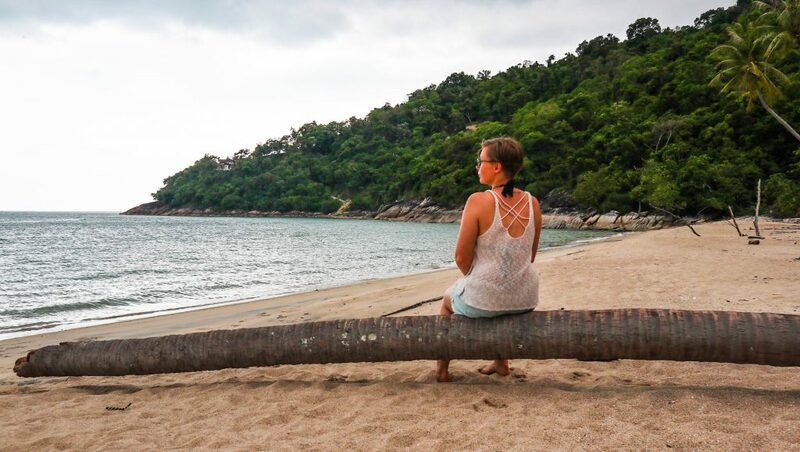 Khanom beaches are not as picturesque as those that you can see on Koh Phi Phi or Koh Phangan, but they have an amazing laid-back vibe, which is hard to find nowadays. Most of them are deserted and you will be the only person there. 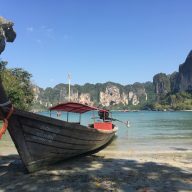 I highly recommend checking out Ao Nang Yee – so called the beach at the end of the road. It is really on the very end of the road that goes along the coast. There is only one bar, where you can buy some good fruit shakes and seafood and enjoy the views over the water. 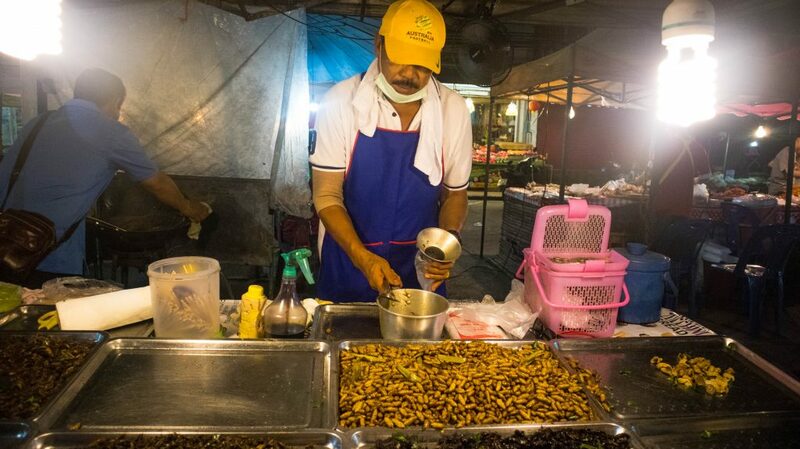 There are lots of delicious things on offer, like fried bugs. Every Saturday, in the center of Khanom, there is a night market. As with any other market in Thailand, it’s colorful, lively and you can buy anything you want here. I thought the selection of food was wonderful. I bought some delicious mango and sticky rice and fruit. The market is really large, so make sure you have enough time to explore it. The fishing community hides away from the rest of the town. By the main canal in the city, exactly where the night market starts, you will find the fresh market. As a foreigner, you probably won’t be tempted to either buy or try the products on offer. Most of the goods are fish, seafood, meat and Thai snacks, such as dried squids and insects. Definitely not for western taste buds. The market in Khanom is loud, dirty and colorful. It can overwhelm those with a sensitive sense of smell. 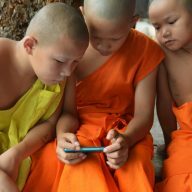 However, it’s a wonderful place for exploring, getting to know Thai way of life a bit better and taking wonderful photographs of the surroundings. This was one of the main things that drew me to Khanom. I really wanted to see dolphins in the wild. Pink dolphins frequent the nearby waters in search of food. They are even the symbol of the town. 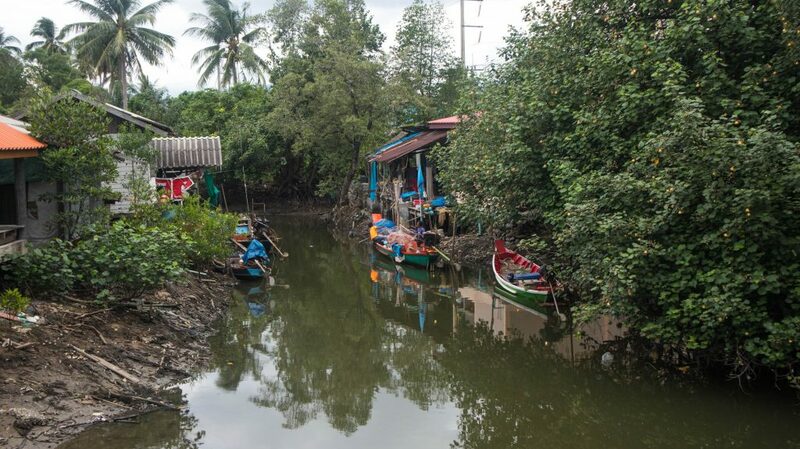 Unfortunately, I was in Khanom during the low season and there were no boat tours available. Inquire at your accommodation. A tour should cost around 1,000 Baht per person. On the way to the waterfall you can see very pretty sites, like this one. This was supposed to be a nice trip to a waterfall, but it turned out to be something quite the opposite. On the way there I caught a flat tyre and spent almost 2 hours trying to fix it. On my way driving there it turned out that my brakes weren’t working properly and that the scooter had to be pushed up and down the hill as the engine stopped every time I reduced gas. Sweaty, tired and quite scared I got to the top. It was worth it though. The views were great and it was a beautiful spot. I haven’t found any information about this on the Internet. A local map I got in the town showed it. The rubber trees can be found on the way to Khao Wang Thong Cave. If you have never seen such plants before, then it will be something interesting for you as you can see small containers attached to the trees that collect liquid rubber. These places are also great for photos, especially on a sunny day. I was alone on the road and took quite a few photos of myself walking along the trees. My pink stallion on its way to the cave. There are a few caves around. The biggest and the most well known is Khao Wang Cave. I tried to reach it one day, but after getting lost and asking for directions a couple of times I finally found out that the cave was closed due to the rainy season. It was probably a good thing that I was warned before considering recent events when a team of Thai boys got trapped in one of the caves. If you’re heading to Khanom, you will need some more information on where to stay and how to get around. I put together this small guide for you. I hope it will be useful. Khanom is a small town, but it’s quite spread out. Most of resorts and bungalows are located around 2 km from the center, along the coast. There are no 7-11s or shops around, only bars and restaurants. You can easily cycle to the town. The owner of my bungalow had bicycles available for free. I wasn’t very keen on cycling in the heat, so I rented an old scooter from her. You can also rent a scooter in the town. I saw some rental shops on the main street. The streets in and around Khanom are pretty quiet, but remember to be careful when driving and make sure you have valid travel insurance! Where to stay in Khanom? Baan Thanayan – I stayed there during my trip. It’s quiet and clean. Rooms are with aircon and good wi-fi. Every day you get water, tea, coffee and they can clean your room whenever you want. The place is far from town and you can take one of the bicycles for free, or rent a scooter from the owner, or in the town. During my stay they were building a swimming pool, so that will be an additional plus. Long-term villas cost from 12,000 Baht per month. Khanom Garden Suite – located in a very quiet area. Bungalows have air conditioning and wi-fi. The hosts really look after their guests and they help out with booking tours and sightseeing. Ava Resort and Spa – on the luxury side, perfect for those that want to pamper and treat themselves. There is a swimming pool and a direct access to the nearby beach. Where to eat and drink in Khanom? There are a few places to eat and drink in Khanom. The restaurants on the beach are quite overpriced. I once paid for tom yum around 400 Baht! You will also see ads for Khanom Seafood. I wouldn’t recommend it as I had a rice soup there for 200 Bhat and it wasn’t very good. For a cheaper option, head to the town. There are a lot of street stalls on the main road. Papaya salad is quite popular here as well as chicken and pork soups. If you want something a little bit more fancy, go to CC Beach Bar. It’s a lovely place during the day and during the night. It’s perfect for a romantic evening.